The new version 2.7.2 has been released. It has better settings page interface, FriendFeed support, ability “Spin” message post templates, support for goo.gl and YOURLS URL shorteners and many other improvements and bug fixes. Ability to “Spin” message post templates. New template tag %ANNOUNCE% Inserts the text till the <!–more–> tag or first N words of the post. New Twitter length of the URLs is now supported. Includes post tags with tags for LiveJournal/Dreamwidth. Woocommerce product tags supported for %TAGS% and %HTAGS%. Ability to use “Custom Fields” %CF-CustomFieldName% in autoposter message templates. Support for YOURLS URL Shortener. 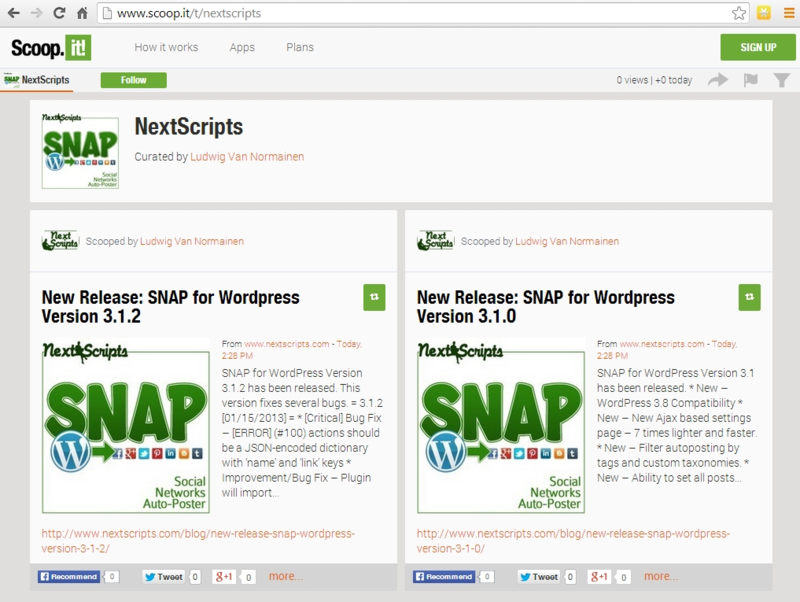 Support for goo.gl URL Shortener. Better interface for “Settings” tab. * Improvement/Bug Fix – New Pinterest interface suppport. * Improvement – WordPress to WordPress posts will include “Excerpt” as well. * Bug fix – WPMU – Accounts loosing selected mode. * Bug fix – Twitter – “Your Message is too long” problem caused by Twitter increasing URL length from 20 to 22 characters. * Bug fix – LinkedIn – Posts were not attaching when posting to LinkedIn Groups. * Improvement – Indicators that some networks have excluded categories. * Improvement – Woocommerce product tags supported for %TAGS% and %HTAGS%. * Bug fix – Blogger line breaks. * Bug fix – Some issues potentialy causing duplicates. * New – Ability to use “Custom Fields” %CF-CustomFieldName% in autoposter message templates. * New – New template tag %ANNOUNCE% Inserts the text till the <!–more–> tag or first N words of the post. 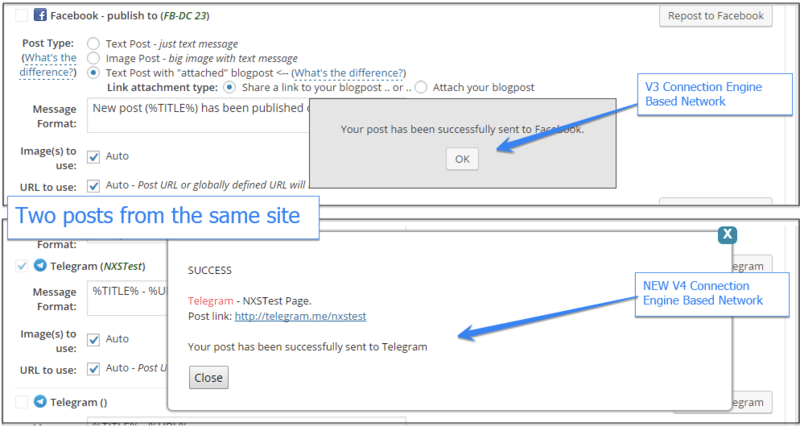 * New – Ability to “Spin” message post templates. * New – Support for YOURLS URL Shortener. * New – Support for goo.gl URL Shortener. * Improvement – All “Message Format” fields are now multirow fields. * Improvement/Bug Fix – additional protection against magic quotes. * Bug fix – Stumbleupon category selection. * Bug fix – Twitter characters limit when %TEXT% is used. 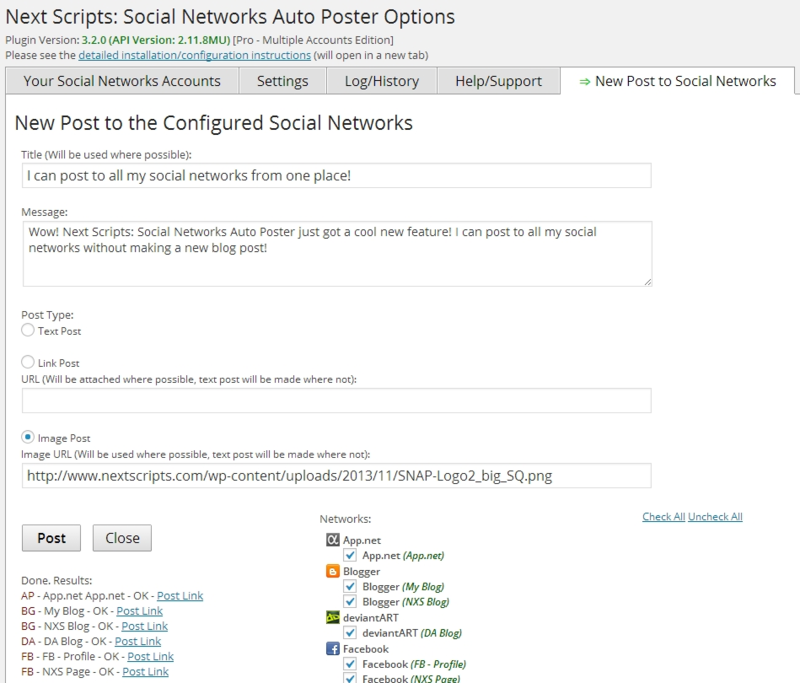 * Bug fix – Autoposting stability improvements. * Bug fix – Featured image location in custom field. * Bug fix – International characters for Blogger (Free API). * Bug fix – Critical Facebook posting issue. * Bug fix – Critical Stumbleupon posting issue. * Bug fix – Post/Don’t Post checkboxes issues. * Bug fix – Twitter – incomatibility with url_f_open set to off. * New – New network: LiveJournal. 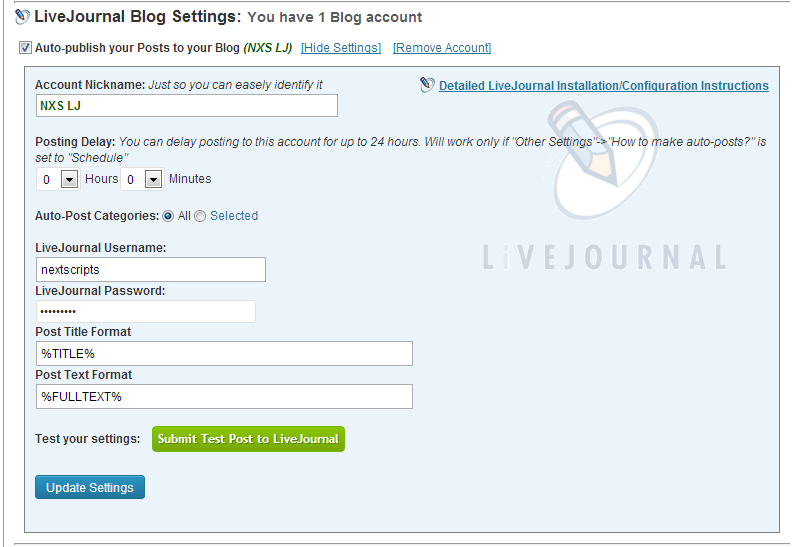 Repost your blogposts to your LiveJournal account. * Improvement/Bug fix – Facebook – better handling of videos in the post. * New/Improvement – external jQuery reference removed. * Bug fix – Pinterest board selection fix. * Bug fix – StumbleUpon connection fix. * Bug fix – Twitter %TAGS% and %CATS% were not found in the text sometimes. * Bug fix – WordPress better handling of connection errors. * Bug fix – Post status saving. * New/Improvement – Ability to change format before reposting when you edit post. * Bug fix – Critical Blogger “Function not found” fix. * Bug fix – Escaped quotes in Message Format.